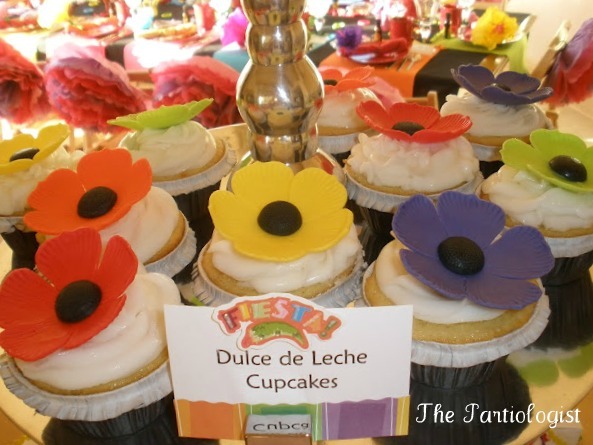 I decided with Cinco De Mayo just around the corner, I should hurry with the rest of the details of my Fiesta! Oh course some of these decorations made me laugh and I hope they bring a smile to your face too! My favorite part of the whole party - the table!! I added tissue paper flowers to the back of each chair which were fairly simple to make, just time consuming. 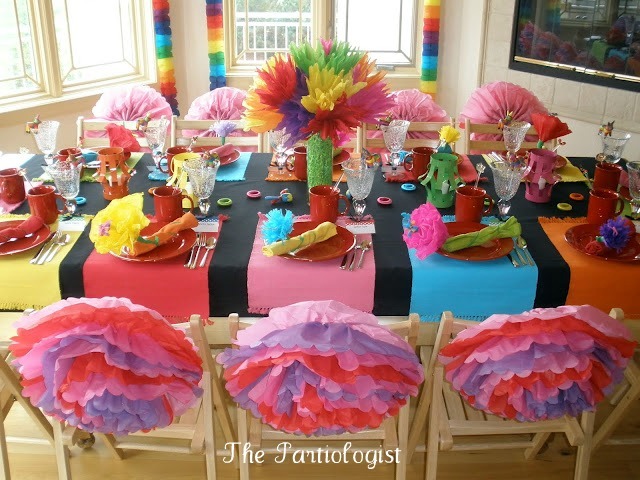 I started with a black tablecloth and hung place mats sideways down the table. 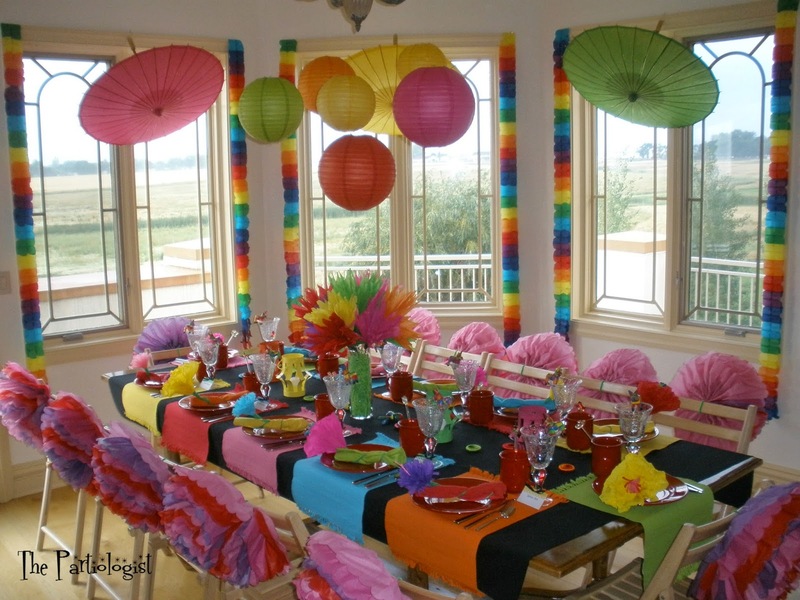 Then put bright colored metal lamps throughout the table with little candles. 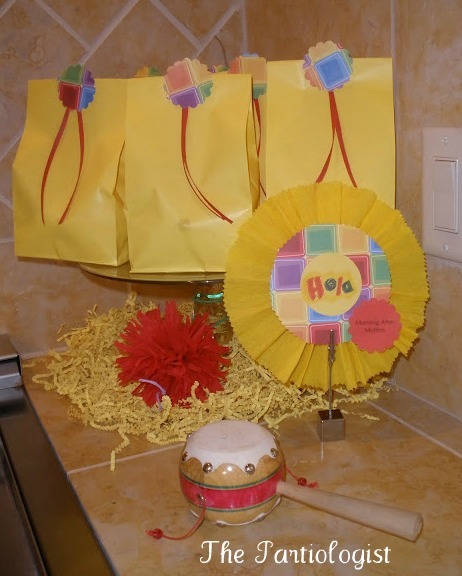 The circles are napkin rings that were placed on the table instead of using them for, well, napkin rings. I used paper flowers with a long wire stem and wrapped them around the cloth napkin. 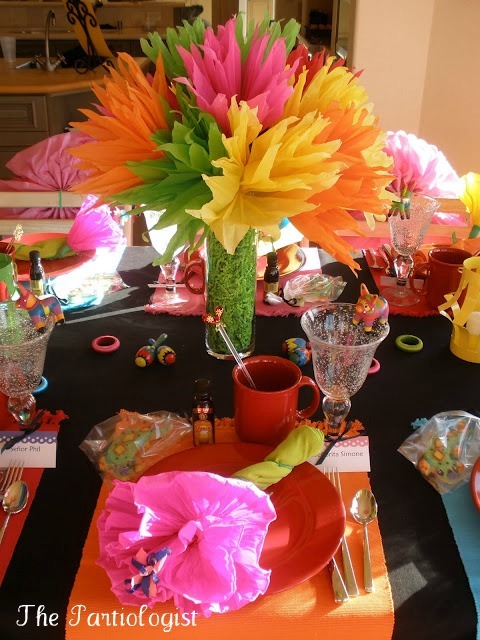 The centerpiece was more paper flowers in a vase filled with bright green paper shred. Notice the little donkey hanging from each glass? And those gecko cookies all wrapped up for each guest. Added maracas to the table and a little bottle of Kahlua in case they needed it for their Mexican Coffee. Lot's of desserts were there for the taking, but the one we enjoyed was the Red Velvet Cheesecake Cake. 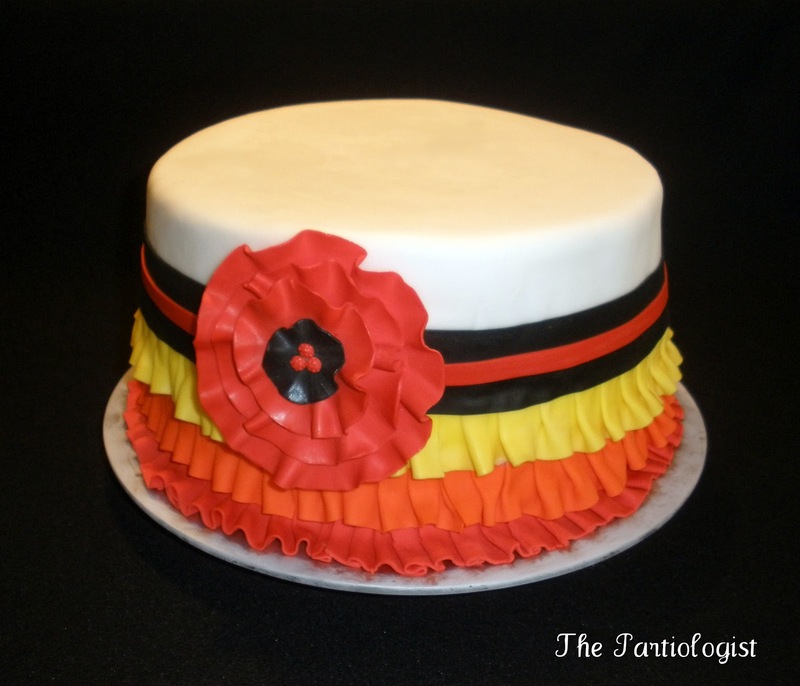 Layers of Red Velvet Cake and Cheesecake - covered in Cream Cheese Frosting and Vanilla Fondant! Doesn't it just make you want to Cha Cha? These were my "Morning After Muffins"! Now, who wouldn't want to wake up to fresh homemade blueberry muffins after a nice long siesta? 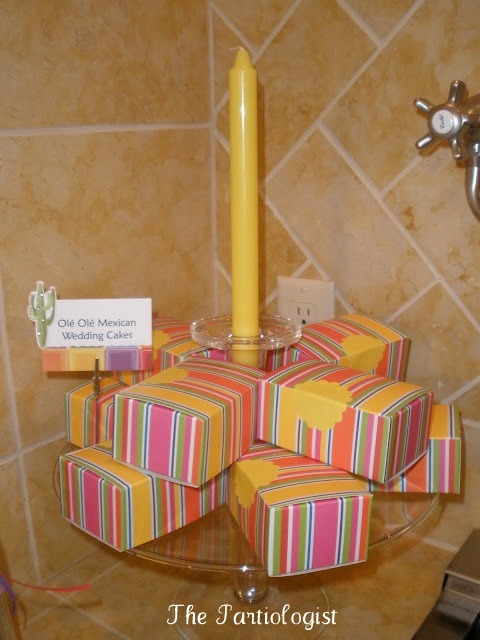 Of course, I had to make some Mexican Wedding Cakes! Can you believe that I have more "Fiesta" for tomorrow?? Can you say Senor` Sangria? KIM!!!! This is an unbelieveably cute POST. My favorite! I think I think that after EVERY post, though, LOL! This Fiesta is amazing. The detail you put into everything! It makes my head spin just thinking about how much time you must put in. I don't know where you get your ideas - truly a gift. Hasta luego! A-MA-ZING!!! How do you come up with this stuff? This is FANTASTIC! You should publish a party book. 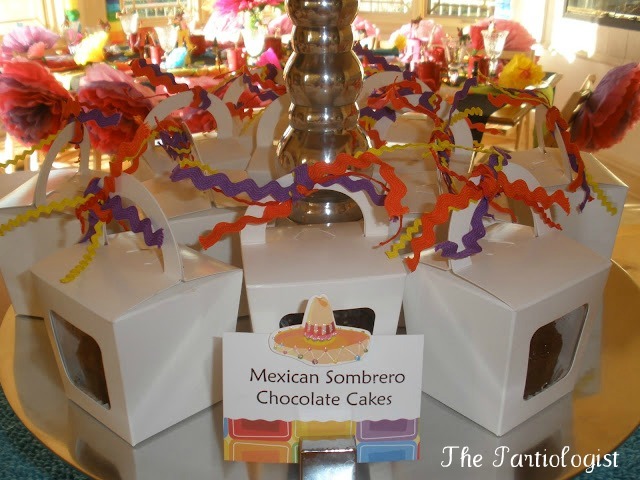 Hi Kim, I work with Jillian at Catch My Party and we're pulling together a post about Cinco de Mayo parties for Disney's Spoonful site. I wondered if it would be alright if I featured your party? We will link back to this page, if that's okay? 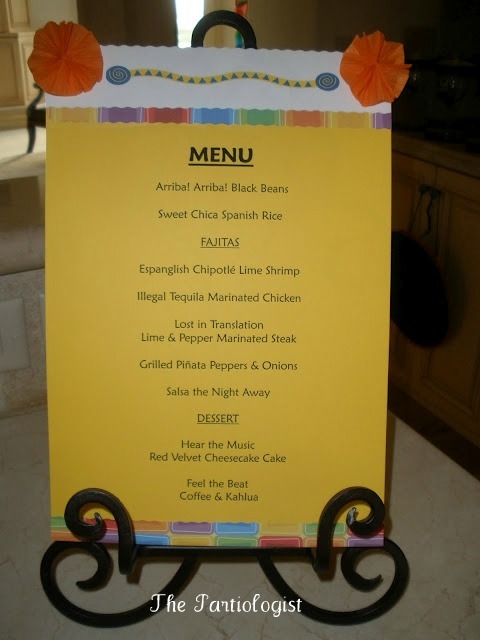 Thanks for your kind comment on my bee printables! Thanks so much!! I really loved seeing your mom's party, she looked just wonderful! I will email you the link to the feature when we post it. Thanks!